Netherland Dwarf rabbits are ''very passive'' and make an ideal emotional support animal, according to the lawyer who filed the federal lawsuit. A former MSU student suffering from chronic anxiety condition has filed a civil rights lawsuit against a sorority which told her she could not keep an emotional support rabbit named Sebastian at her sorority house in East Lansing. 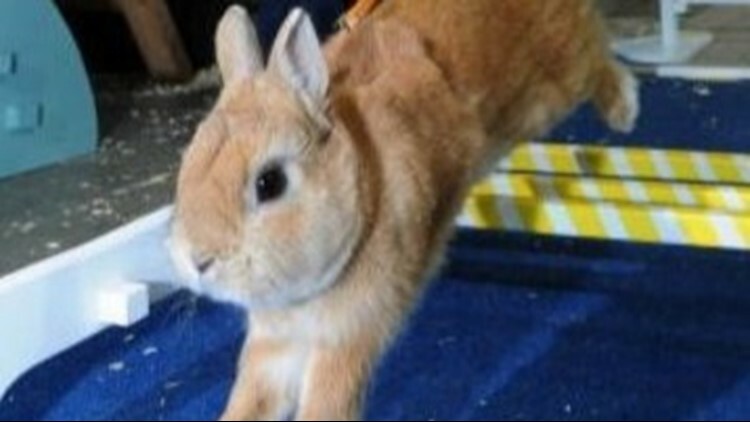 GRAND RAPIDS, Mich. - A former college student who used a rabbit to ease a “chronic anxiety condition’’ claims she was forced out of her East Lansing sorority because her emotional support animal – a Netherland Dwarf rabbit named Sebastian, wasn’t welcome. Kayla Hicks says her impending eviction from the Beta Gamma Chapter house earlier this year caused “emotional distress, outrage and embarrassment,’’ according to a federal lawsuit filed this week in Grand Rapids. Hicks says Tennessee-based Alpha Omicron Pi Fraternity, Inc. is in violation of the Fair Housing Amendments Act and the Persons with Disabilities Civil Rights Act. A voice message left Thursday morning with Alpha Omicron Pi was not returned. Hicks last year sought membership in Alpha Omicron Pi‘s sorority, the Beta Gamma Chapter house on Charles Street, the lawsuit claims. She signed a housing agreement and provided paperwork for Sebastian, which was registered with the National Service Animal Registry. The lawsuit says Hicks has suffered from anxiety for several years, which includes panic attacks. A psychiatrist recommended she use an emotional support animal to cope with anxiety. Hicks also got a letter from a veterinarian stating that the rabbit was “healthy and social,’’ according to the lawsuit. When she brought the rabbit to her sorority house for her birthday in November of 2017, Hicks was told the rabbit was not permitted. The issue came up again when Hicks moved the rabbit into the sorority house earlier this year. She again was told the rabbit was not permitted. Hicks was told if she brought the rabbit into the sorority house, she would be evicted. Faced with an impending eviction, Hicks moved out of the sorority house in March of 2018. The experience caused Hicks “emotional distress, outrage and embarrassment, humiliation, anxiety and denial of her civil rights,’’ the lawsuit claims. Hicks has since graduated and moved out-of-state, her lawyer said. Netherland Dwarf rabbits weigh between 1½ and 2½ pounds and have a skittish, quiet, shy and sweet temperament, according to Petguide.com. They have a lifespan of between 10 and 12 years.